After a long trip to Africa or Alaska, where you have taken many images, and hopefully some specials ones. Upon first review, you go through your images and think you got all the best ones marked out. Sometimes you are so excited you potentially could miss an image that’s really a star. One of the best ones of your trip. I actually flagged this one and rated it, but never did anything with it until now. Sometime a second pass, or a third pass through your images after a reflective period of time gives you some gems out of rough stones that are most of your raw captures. 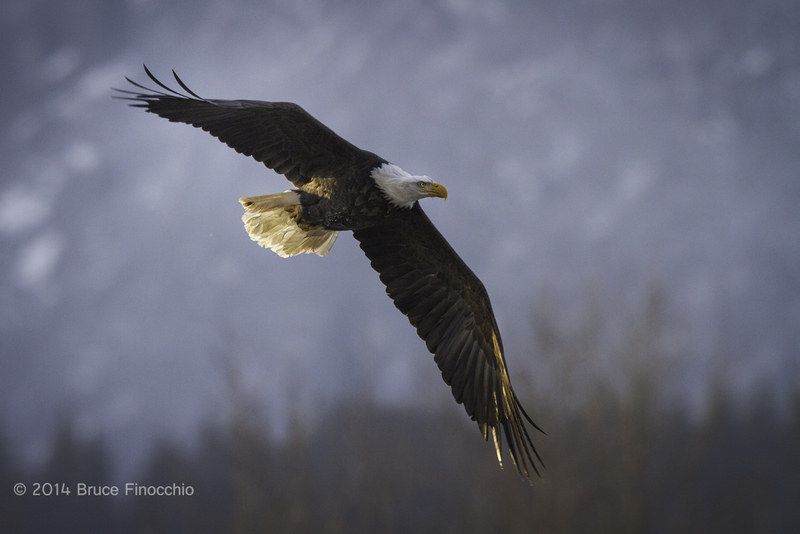 This image is one of my best Bald eagle in flight images. I would not have recognized it as a jewel, if I did not go through my 2014 Alaska trip images a second and a third time. Also, with the advance in post-processing techniques, sometimes an image doesn’t appear at first glance to be something that can be truly great. Now, I look at raw files from the point of view of what is possible and how I can make the image closer to what I saw at the moment of capture. So it pays sometimes not to give up on an image, and to keep your raw files instead of permanently deleting them. With storage so cheap, you can keep the rejects as long as you want. One of my friends, use to laugh at me for keeping all my slides, even the ones that were a bit blurry. She would be laughing at me now as well. Here though I found an image that I really like. One that I could have easily deleted and been gone forever. With technology forever changing and getting better, it pays not to be too hasty in deleting images. I am going to get a scanner soon, and scan some of my old slides, ones that have the prospects and could become great with a little post-processing miracle. I think back of my 2 days at your ranch as one the most beneficial photography experiences I have had. I will have to come back for another glimpse of how to do it!! Next Next post: Nothing Stirs A Male Lion Like?